an UCI compliant chess engine written by Mark Uniacke. HIARCS is an acronym for Higher Intelligence Auto Response Chess System, and its history of development lasts over 30 years now. Because HIARCS is written portable in C, it is available for multiple platforms such as Pocket PC, Palm, Apple iPhone & iPod Touch, PDAs, PC and Macintosh computers. The inspiration for the new HIARCS search was sought from the book Chess Skill in Man and Machine and in particular the article "The heuristic search: An alternative to the alpha-beta minimax procedure" by Larry Harris from Dartmouth College  . HIARCS was still written in the relatively primitive BASIC programming language and being interpreted it meant the program was rather slow. To compensate for this I developed some heuristics to help guide the search and evaluation in a more targeted way. End of the 80s HIARCS was rewritten in C. In 1991 HIARCS 1.0 was released for PCs and the MS-DOS operatig system. Subsequent Hiacs versions were compiled to run under various processors and operating systems, such as x86 and PowerPC under Windows and Mac OS, as well as mobile devices. The rewritten HIARCS soon competed in computer chess tournaments, in 1989 the 1st Computer Olympiad, and the WMCCC 1991 in Vancouver where HIARCS won the title of the World Amateur Microcomputer Chess Champion. HIARCS won the gold medal (shared) at the 4th Computer Olympiad, and became World Microcomputer Chess Software Champion at the WMCCC 1993 in Munich. HIARCS won several other tournaments or got top rankings, it won the IPCCC 2007, after Rybka's disqualification in June 2011 the WCCC 2008, and the ICT 2009 . Further, HIARCS is two time World Chess Software Champion, succeeding at the WCSC 2011 in Tilburg, the WCSC 2013 in Yokohama, and the PT 51 and PT 53. HIARCS' opening book authors over the time were Eric Hallsworth, Sebastian Böhme and Harvey Williamson, who is also operating HIARCS regularly at various computer chess tournaments. HIARCS is written entirely in 'C' on a very spare time basis. HIARCS searches around an order of magnitude less positions per second (av. 18,000) than most of its competitors. However, it makes up for this apparent slow speed by clever searching and accurate evaluation. HIARCS uses many selective search extension heuristics to guide the search and incorporates a sophisticated tapered search to resolve tactical uncertainties while finding positionally beneficial lines. HIARCS won the title of World Microcomputer Chess Software Champion in 1993 in Munich, Germany and has won numerous other computer and human tournaments. HIARCS 7.0 is currently the top rated chess program on the SSDF and Selective Search rating lists. In April 1997, HIARCS 6.0 became the first PC chess program to win a match played at tournament time controls over a FIDE International Master. This great achievement was further built on when HIARCS won the Godesberg Open ahead of Grandmasters and International Masters. The version competing in this tournament is a new experimental version. The program will be a 32bit Windows version of HIARCS and will support tablebases. It is expected that all 4 piece and most 5 piece endgame tablebases will be available. 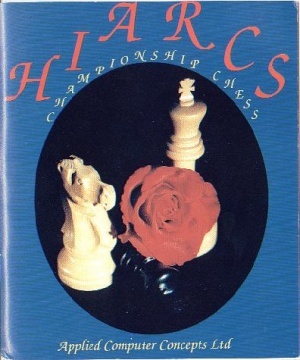 HIARCS is one of the few original PC chess programs still competing in top level chess competition. It has been in development over the last twenty years and since 1991 has always been among the top chess programs in the world. In this time it has led world computer rating lists and won World Championship titles. It was the first PC chess program to defeat a FIDE International Master in a match and has been a favourite of a number of World Chess Champions. So much so that Garry Kasparov said towards the end of his match with Deep Blue2 that "HIARCS is much better positionally than Deep Blue". HIARCS is available on a number of platforms including PC, Macintosh and handheld devices. The handheld Palm version has won multiple matches against GMs and even won a GM/IM tournament in the Philippines. HIARCS' playing style is now very aggressive with a distinctive liking for attacking the opponent's king. This often leads to dynamic exciting games which are often played on a knife-edge. HIARCS is now capable of taking advantage of multi-processors/cores to improve its chess performance making it a very dangerous opponent. HIARCS is commercially available since 1991. PC- and Windows versions until 12.0 were market as ChessBase engine in conjunction with the Fritz GUI  , PC Chess HIARCS 13 UCI is purchased as download product from its own site  , and requires a Windows PC and an external GUI supporting the UCI protocol. HIARCS 12.1 and 13 are the chess engines of Pocket Fritz by ChessBase   . Since August 2012, HIARCS has its own GUI. 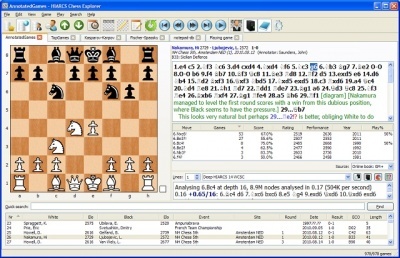 The HIARCS Chess Explorer is bundled with HIARCS 14, based on the program which won the WCSC 2011, and can further be used with any UCI compatible chess engine  . This page was last edited on 15 November 2018, at 20:18.